The Association of Special Libraries of the Philippines, Inc. (ASLP) in cooperation with the Zamboanga del Norte Provincial Library, would like to invite you to a four-day, three-night seminar on "Challenges and Opportunities of Librarians and Information Professionals in the Age of New Technology” on April 27-30 at the Bamboo Garden, Dipolog City. With this aim in mind, we are organizing this seminar to prepare librarians and fellow information professionals for the different challenges and opportunities facing them in the age of new technology. Librarians, library administrators, archivists, record officers, support staff, teachers and students of Library & Information Science, and other information professionals are invited to attend the said seminar. Thank you very much for your support and we hope to see you on this event. 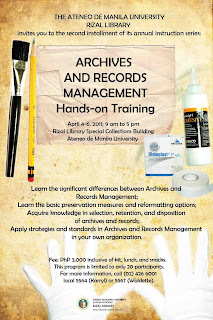 Archives and Records Management on April 4-6, 2011 from 9 am to 5 pm at the Rizal Library Special Collections Building. 4. 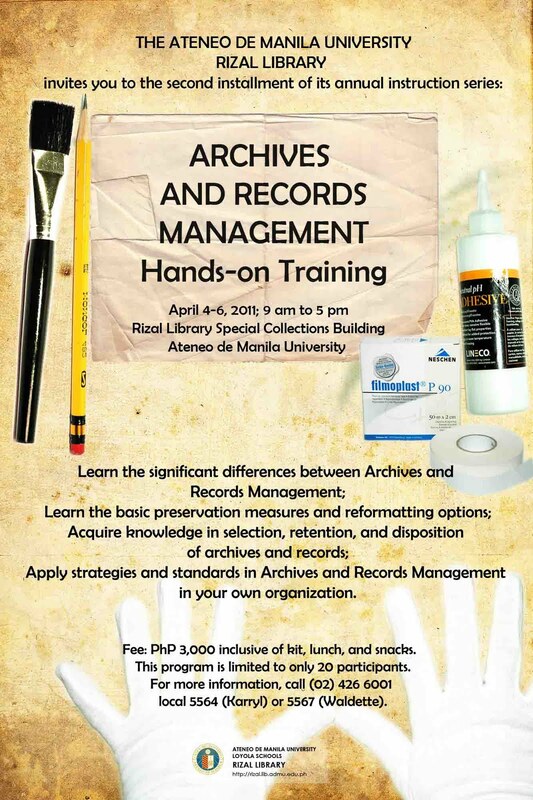 Apply both trends and standards in archival and records management in your own organization. The fee for the training program is PhP 3000 to cover the kit, 6 snacks, 3 lunches and other expenses. Checks may be made in the name of the Ateneo de Manila University. The program is limited to 20 participants only. Admission is on a first come first served basis. Please make your reservation with Ms. Karryl Sagun at 426-6001 loc. 5559/5564 and with Mrs. Waldetrudes Cueto at loc 5567 or directly to me at 4265961 and 426-6001 loc 5550/5551.